I have been a stay at home mom for 15 years. Just because I’ve not worked outside the home for more than six months in that time doesn’t mean I haven’t tried ways to contribute financially to my family’s income. Over the past couple of years I’ve sold everything from Avon to Thirty-One. I wore different hats all the time. One day I’d be the saleslady, the next the banker and the next day the graphic designer/marketing director. It was there, in the graphic design and marketing realm that I discovered PicMonkey. 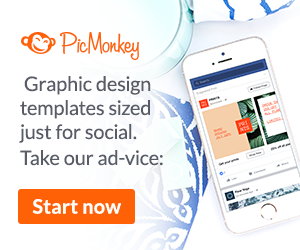 PicMonkey is an online photo editor and graphic designer. Honestly describing it that way does not do it justice! You can use it to do basic photo editing such as cropping, adjusting exposure, sharpening and more yet if you need to retouch a beautiful portrait you can do that, too. Everything is there, blemish removal, airbrushing, teeth whitening, spray tan and lots of other options! I used the design option most of the time to make sale graphics for my businesses. You can choose templates offered by PicMonkey or you can build your own design. Another tool I used a lot was the collage maker. Everything looks so polished and professional and it’s super easy to use. When I first discovered PicMonkey the tools I needed were free, which was great! Recently when I decided to blog full time I wanted to use it again to design my logo. I realized what I needed was not offered for free and to be able to continue using PicMonkey I’d have to sign up as a member. I really didn’t want to spend the money but after thinking about everything that I would be able to do for my blog photos and graphics it was really a no brainer. Do you know how many times I go on there to add text to my pictures? Another bonus for becoming a member is the Hub. The Hub is storage in PicMonkey that you can access through all your devices. What’s cool is that if you’re working on a design on your phone you can save it in the Hub and then later when you’re on your computer you can pull it back up and edit it some more. Let me tell you a little bit about the two price options and I’ll go in depth to explain what else you can do in PicMonkey. I have the Basic membership but would not hesitate to upgrade if I need more Hub storage. So now that we’ve looked at the price lets talk about everything you can do with PicMonkey. You shouldn’t have a problem finding cool fonts for your projects yet there may be one you have that would be perfect and in that case you can use your own! If you decide to use yours make sure you are able to. Some fonts you download from sites have creator’s notes which you may have seen (hopefully) and they will specify if the font is free to use or if you need a license. Depending on what you are making you’re going to want to make sure you don’t violate their terms. This category is so huge I’m only going to list the main themes. Each theme has a host of sub-categories like overlays, costumes, effects, text and texture. Keep that in mind when reading through the themes – they offer a LOT of extras! Wow, that was a LOT to cover! I use PicMonkey almost every single day. I don’t have Photoshop or any of the other photo editing software – mainly because it’s so expensive and hard to use, and honestly this is more than enough for all my needs. What’s nice about not being tied to a software program is the ability to use PicMonkey on all my devices. I can use the app on my phone or log on from my laptop. It’s always handy. As a blogger I use and love it to edit my photos. And it’s actually very user friendly. Whether I’m making a Pinterest pin or putting together my sidebar welcome pic, all of it can be done in one place. In this post I’ve listed all of the major categories/effects you can use. In addition to those are many other options but keep in mind that some of the options are only available to members. That means that if you find a font or overlay you love and it says it’s only available to members you’ll have to pick another. But what’s cool is that you can start a seven day free trial before you commit. And you can use those Primo items. Whether you’re a blogger, photographer, direct seller or any other person under the sun, you should try PicMonkey and see if you think it’s for you. Let me know if you’ve used it or if you’re thinking about trying it.